and very busy! I have been wanting to share a post for quite a few days now, but my body has been hopping to and fro and when not hopping, I have been coughing. Yes, I caught the dreaded "spring cold" that probably is a leftover of the winter wrath. It came on without any clue I was getting sick and before I knew it I was in the throes of coughing and hacking about. Which, the horrible complete body spasms from coughing, inflamed my sciatic nerve and then every cough, every sneeze, every movement caused a horrible, terrible electrocution feeling down my left leg that left me sobbing. Anyone that has ever dealt with sciatic pain understands exactly where I'm coming from. Sciatic pain is some of the worse pain I've ever had to deal with. I couldn't sleep in a bed for 4 days, one night I couldn't sit, couldn't lay...So I leaned against a wall for hours. It was horrible. But thankfully, with some fluids, rest and Advil...I finally am back to normal...I still have the odd twinge from my sciatic, but it has calmed down mightily. It will go away steadily now that I'm not coughing my head off every 30 seconds. *I absolutely adore this piece...the satin stitches which could be called bargello, flame stitch, flourentine stitch, but it is essentially at its base level - satin stitch - is absolutely fabulous. I am LOVING how this is turning out! Stitching on 32 count limited run Lakeside Linens stitching with DMC not the NPI silks called for. *again information on colors, fabric, etc may be viewed at tab above under "Let Freedom Ring Progression"
And lastly I had a new start and a border of my own creation for the new series by Country Cottage Needleworks. The New series is a ten part series and it is entitled "Main Street". You can read all about it HERE. I cannot offer this in PDF printable format because it was created by using the free version of PC Stitch. It is in my Flickr album and if you blow it up (by clicking on the spyglass in Flickr) you can see the stitches on the graph visually from your computer or your tablet - EASILY. So please don't ask for a "hard copy" or a "printable copy" I stitched it myself using my flickr album and iPad. I didn't have a printed copy myself. I've done a lot and all of those items may be viewed under the tab "My Finishing Service" and clicking on the 2017 Finishing Link contained within...I am currently up to 208 finishes that I have completed for clients since January 9, 2017. Blessed to be very busy! Thank you to those who use my finishing service. It is my honor to finish for you! I don't like him gone...but such is the way of an engineer in the throes of a sell off. Thank God for your blessings! 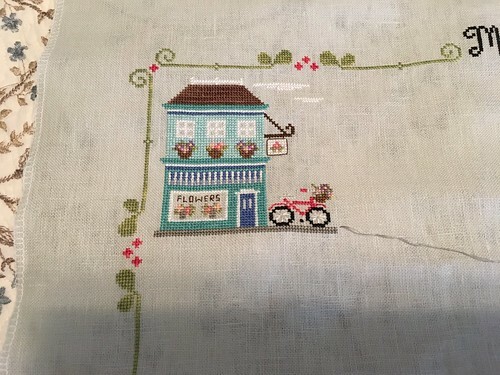 What a fun post full of beautiful stitching! So sorry to hear you suffered so much from sciatic pain with that nasty cough. :( I've had sciatica, but never that badly. Good to hear your news too. Hope all the travel for your hubby isn't too terrible for everyone. I always hate when my DH has to travel too. That's a lot of travel! You continue to amaze me. Accomplishing all of that when you don't feel well and are in pain? Really? I'm dumbfounded and feel like the laziest person on earth. Your dye job on that fabric is incredible. Your free-stitch bicycle is perfect. And the new border is a gem... thanks so much for sharing. All your stitching is just beautiful. I see grand prize fair winner in your future! Take care and stay healthy --- you need your strength! Wow, all of your pieces are lovely, as always! The dyed fabric is such a beautiful combination of colors and it really seems to glow! I also love your Main Street! The borders and the bike are so fun! Vonna, it was good to read your post this AM with my coffee. Happy to hear Katie is home for the summer and the kids are nearing the end of their school years. All of your stitching is incredible. The fabric you dyed for the mermaid is stunning. Did you heat set it once it dried? Very glad to hear you are feeling better! Enjoy your week! I know exactly what you mean about the cold and the sciatica ... I've been suffering from both too... so happy when they calm down. Your stitching is WONDERFUL!!! Your Main Street border is so creative. And I LOVE the linen you dyed for the mermaid... I've used Rit dye before but have never thought about painting on the linen... what a great idea. Thanks so much for your generosity!! Sending positive thoughts and prayers for a lovely summer for you and your family! As always just beautiful!!! 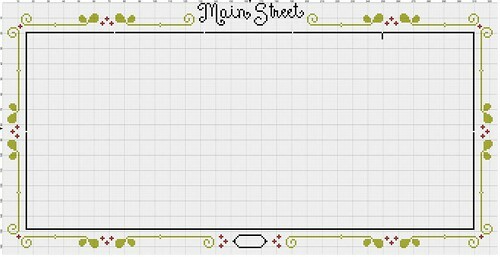 I'm thinking I'm going to have to start the Main Street series now lol. Lovely! And I hope you do fell better! You are wonderfully talented and generous! Thank you for all that you share with us. Vonna...so sorry about your extreme pain...I've had sciatica and it is painful, but mine was not as severe as yours. Your works in progress are lovely...what a darling idea...to insert a bike! Wow! Your dyed fabric is perfect for the mermaid. Hoping that cold is soon gone! I love all your stitchy thaings. Very awesome as always. 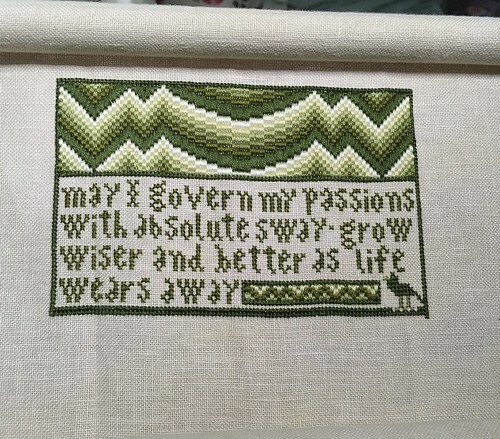 Great stitching (as always!) 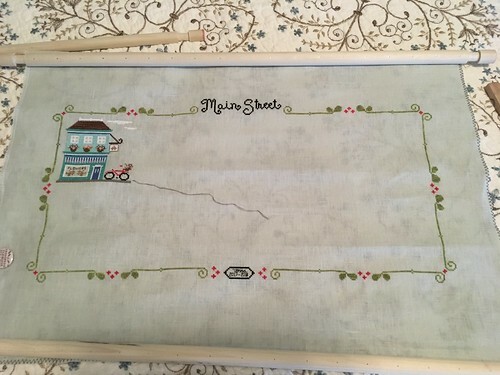 and I absolutely love that border you designed for Main Street! Hope the cold and nerve pain are gone by the time you read this! Vonna, take good care of yourself. That business sounded terrible! My sweet daughter had planned to spend some of Mother's Day with me and she has something very similar to your bug. So I have yet to see her to celebrate. I plan to start the American project soon. However, I have 2 ancestors who fought in the Revolution. I am trying to decide if I should use their names . That would make it very personal. I love your border and believe me you will get all the credit! Wish you could come to St. Louis with your husband because we have a large stitching group here that would love to meet up with you! Kathy, I very well may be coming to St. Louis in June. Care to e-mail me so I can talk with you about it, if I do come? I'd love to stitch with like minded souls! Just saw this. I will send you a PM. Glad to hear you are feeling better. 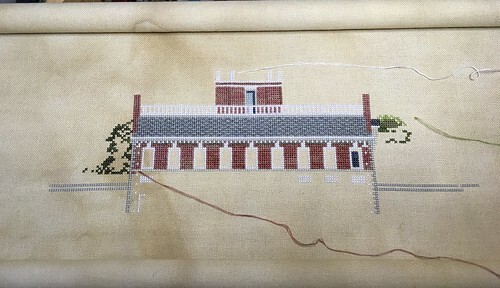 Your stitching projects are amazing. I can't keep 2 straight I can't imagine having as many going as you do. Hope you are feeling better. I think that when I fell in September I messed up my sciatic nerve - also left leg. I thought it had been getting better, but the last three weeks it's been pretty bad - even walking I end up gimping. Grrr! I can literally feel your pain Vonna. So sorry to hear how sick you were; glad you are feeling better now. Your stitching is gorgeous. I too have several projects going at the same time. I love your hand-dyed fabric. The colors are stunning. Your creative talent is flowing again with your border design. I love it !! Have a great summer with the kids. Sorry to hear about your husbands schedule for the next several months. Enjoy the time he is home. I'm thankful for your finishing service......and I have lovely treasures to enjoy!! Oh, your stitching is so gorgeous--just love seeing the two large pieces grow. Your little changes make them so very special... I'm not stitching them, but you sure are tempting me! Beautiful work on everything and glad you're feeling better! I'm glad your feeling better and I hope that sciatic pain never visits you again. So glad to hear that you're feeling better. Sciatic pain is the worst! Thanks for sharing your border. I love the bicycle you added to your Main Street. I love the progress you are making on all your projects. How do you find the time to do everything? Love your blog. So sorry to hear about your inflamed sciatic nerve. I know the pain that results from it and I'm glad that you are already feeling better. Nice progress on your projects. Your stitching as always is just lovely! I feel for you with the sciatica. I am going through the exact same thing right now. I had back surgery 6 years ago. After a long recovery, I felt great, now suddenly this is back! OMG! What helped you the most? Do you think stretching exercizes would help or make it worse? Wow, that dyed fabric is gorgeous! And great job on the bike, too. Beautiful stitching and your hand-dyed fabric is gorgeous. I get sciatic pain occasionally so I know how you felt. It's horrible. The Diagonal Pin Stitch . . . .